I was just having one of those days: stressed out, spinning around in circles, frustrated about my progress and how the week was going. Plus it was raining. What do you mean it’s only Wednesday?! I took a deep breath and knew what I had to do. After work, with supportive friend in tow, I made the 16 minute trek to the cobblestoned street with the bright pink bicycle outside. 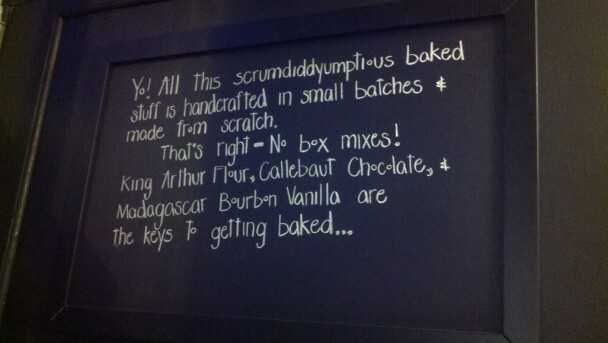 Upon entering, I was greeted with the smells of delicious baked goods, Intelligentsia coffee, and happiness. Though there are countless cupcake shops I could go to in this city to get a sugar fix (this little shop is right down the street from the famous Georgetown Cupcake and a Sprinkles), Baked & Wired rises to the top with it’s emphasis on fresh ingredients, unique flavors, perfect frosting-to-cake ratio, amazing coffee, and general amazingness. Baked & Wired is one of those places I find myself coming back to over and over again. It’s one of those places that can always cheer me up- and not only because of the delicious cupcakes and coffee bar, but also because of the chilled-out and friendly staff. This is a place where friends come to gather, read, study, and enjoy. Part coffee-house, part bakery, and part art-gallery, it’s not a mystery why Baked & Wired has so many fans. 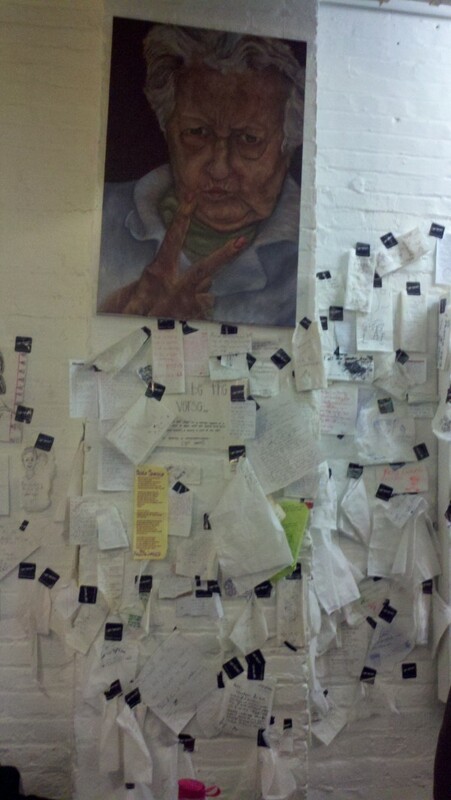 Baked & Wired fans leave their napkin love letters on the wall. Yes, sometimes my self-care ritual involves chai cupcakes from Baked & Wired. But the most important parts of this ritual involve gathering my friends and spending time with them in places that I love. Fortunately, I have found some great ones who don’t mind listening to me vent, especially if I bribe them with sweets and caffeine. Where are the places you go in your city when you need a pick-me-up? This entry was posted in Chat, Washington, D.C. and tagged coffee, comfort food, cupcakes, DC, melissa, taste. That old lady with the peace sign is who I want to be in 70 years. Recently my sweet tooth has been craving chocolate, cakes, cookies, anything and everything your dentist would strongly advise against. There’s a cupcakery called LOVE 5 minutes away from my house on Nanluoguxiang that makes pretty good (and expensive) treats. I’ll splurge there, or there’s a homestyle Japanese restaurant called Suzuki Kitchen on my block that has the fluffiest cheesecake in town. No shortage here! There are some seriously incredible cupcakeries around SF and Berkeley, but Baked and Wired looks incredible. 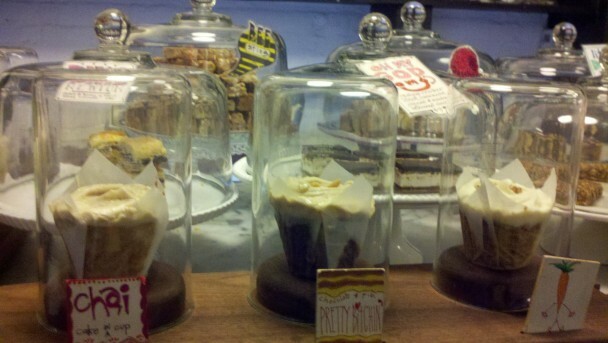 But tell me my eyes are deceiving me – in the picture of the cupcakes, is the middle cupcake called “Pretty Bitchin'” ? That’s epic. What type of cupcake is it – you know, other than sheer awesomeness? Your eyes are not deceiving you! The Pretty Bitchin’ is a chocolate cupcake with crunchy peanut butter frosting (Pretty Bitchin= PB?) andddd it’s delicious. I love the names of the treats in this store :) Right behind the cupcakes in the picture (not sure if you can see) are the “OMG bars” with marshmallow, caramel, chocolate and graham cracker crust and the Razmanian Devil (lemon cupcake with rasberry filling). Those look soooo delicious. Yumyum chai cupcake! Have you ever tried their fig newton? Oh good lord it’s about the best thing on the planet. I was just told by a friend of mine that Baked and Wired is owned by the parents of Zak, a mutual friend of ours from college! And she is almost certain that the old lady painting is Zak’s work. What a small world!!! Very cool/strange! I had no idea :) It’s funny how I keep running into UCSD’ers around here! Got it! Misread your comment :) but yes! Small world!